Port general description: This port is located at the Caleta Paula inlet, 3,5 km south of the town of Caleta Olivia, designed to operate fishing trawlers, reefers, coastal and merchant vessels up to 140 m LOA. 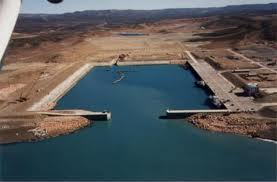 The port consists of a rectangular basin measuring 455 m x 250 m oriented in a ENE /WSW direction with an opening of 80 m at the center of its eastern side giving access to the basin from the sea through a channel 1250 m long, 150 m wide and depth in the channel is 7,50 m (24´). 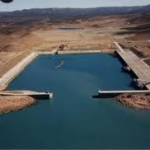 The northern side of the basin forms the quay of 455 m length for use by ocean going vessels of up to 140 m LOA; the northeastern entrance arm provides a berth 80 metres long for coastal fishing vessels or small craff. 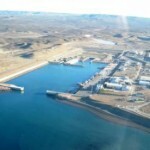 This additional quay gives a total frontage berth of about 535 m. At the premises, API. Astilleros (API Shipyards) is constructing a shipyard for vessels LOA 160 m, working around a syncrolift with transfer capacity up to 10,000 tons, 12.000 sqm covered area and pier for repairs 110 metres long. The principal quay on the north side has a width of 40 m and depth at datum alongside is 9,60 m (31´). Tidal rise and fall averages approximately 6 m (19 ft). Both quays provided with fenders; towers provide day-like illumination for operations round the clock. Available 9 taps, 63mm diameter, 8 at rate 20 cbm/h and 1 at 40 cbm/h. Gas oil from Petrobras terminal (8 tanks 15000 cbm capacity). 9 intakes discharging to 2 tanks 20 cbm each. Available for underwater repair and inspection. Available from local stores at Caleta Olivia. A 2,3 hectare zone for general cargo and dry and reefer container storage. Only minor, by prívate firms. There is a ramp 110 m long x 15m wide, for shipyard repairs, operated by API astilleros, same firm constructing the new above mentioned shipyard. Compulsory for foreign vessles. Must be requested from Puerto Madryn. As per Dec 2012 predictions. HAT 5,96m MHQ 5,15m. LAT 0,07m MLW 0,99m. Requested by shps agent or directly to port head. Regular land services to/from Comodoro Rivadavia, Rio Gallegos, Buenos Aires and citiesin between. 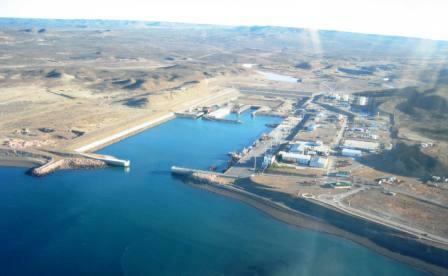 Airlines operates from Comodoro Rivadavia covering regions north and south. Available from one public hospital and Four prívate medical centers. 2 launches of 230and 260 HP are available.